Smash Shot of the Day: Ooh la la Lumiose! New Stage Reveal! Masahiro Sakurai has revealed today that Smash Bros. for 3DS will feature the flagship city of the recent Pokemon X and Pokemon Y video games as a destination for the Nintendo's iconic characters to brawl in! 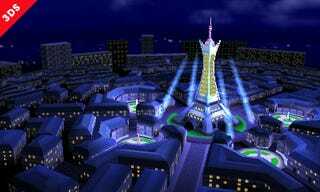 Lumiose City is seen in the screenshot above, which features the bustling city at night time, where the Prism Tower is lit up in all its splendor. Along with the image, Sakurai states "Up until a few seconds ago, the fighters were brawling on top of that tower. No, really." This tidbit indicates that the stage could play out like previous maps that travel about a large contained world for multiple backdrops. From Mute City in Melee to Delfino Plaza in Brawl and now Skyloft in Smash U, the traveling stages are maps that change the layout of the arena per each "stop" as the platform and stage rotates from one backdrop to another. This allows the stage to feature as many neat references to the game world as possible. What are your thoughts about the reveal? Happy with the inclusion? What do you expect to see in the stage, between the backdrops as well as the stage hazards?